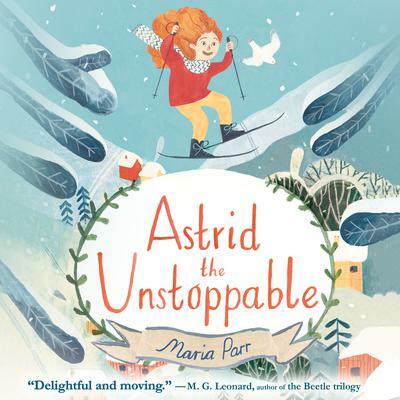 Pippi Longstocking meets Heidi meets Anne Shirley in this tale of an irrepressible girl in a mountain village who navigates unexpected changes with warmth and humor. Speed and self-confidence, that’s Astrid’s motto. Nicknamed “the little thunderbolt,” she loves to spend her days racing down the hillside on her sled, singing loudly as she goes, and visiting Gunnvald, her grumpy, septuagenarian best friend and godfather, who makes hot chocolate from real chocolate bars. She just wishes there were other children to share her hair-raising adventures with. But Astrid’s world is about to be turned upside down by two startling arrivals to the village of Glimmerdal: first a new family, then a mysterious, towering woman who everyone seems to know but Astrid. It turns out that Gunnvald has been keeping a big secret from his goddaughter, one that will test their friendship to its limits. Astrid is not too happy about some of these upheavals in Glimmerdal — but, luckily, she has a plan to set things right. Maria Parr is a writer and high school teacher. Adventures with Waffles, her debut novel, has been translated into twenty languages and won several awards around the world. Parr lives in Norway with her family.